If you paint in oils, you will need solvents to thin your paints and mediums. You will also need solvents to clean your brushes and palette. 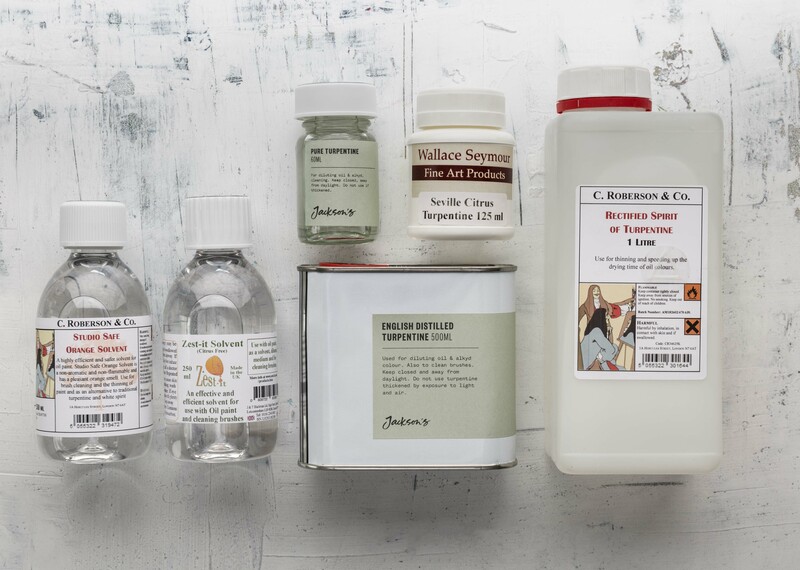 However if you’ve browsed through the Solvents department at Jacksonsart.com you will have realised there are a lot to choose from! So which should you use? In this post I will explain what you need to know about White Spirit, Turpentine and Citrus-based solvents. What is the difference between white spirit and turpentine? Turpentine is made of the natural resin extracted from trees, and white spirit is made of petroleum distillate. White Spirit tends to be less flammable and less toxic than turpentine. But what does this mean for you and your oil painting? White Spirit is known by a number of names. In the US/Canada it is most commonly known as Mineral Spirits. In Australia and New Zealand it is known as mineral turpentine. Turpentine Substitute, Petroleum Spirits and Paint Thinner are some other names for White Spirit. If you come across a solvent that has the word ‘mineral’ in its name, it is most likely to be a form of white spirit. If you’re sensitive to fumes, use Low Odour Solvent. Perfect for thinning paints mixed with Alkyd paint mediums such as Liquin. White Spirit can have a strong smell and cause dizziness or nausea. Always use white spirit in a well ventilated room. If you use it for a long time or regularly it can cause contact dermatitis. You can avoid skin reactions by wearing latex gloves and simply avoiding direct contact where possible. Can I use White Spirit from the DIY Store for my Oil Painting needs? In a word, no. Household white spirit (from a DIY store) has more impurities than Artist’s White Spirit, and should be kept away from your oil paintings. It will contain more impurities such as residual sulfur, and this makes it much less artist-friendly. 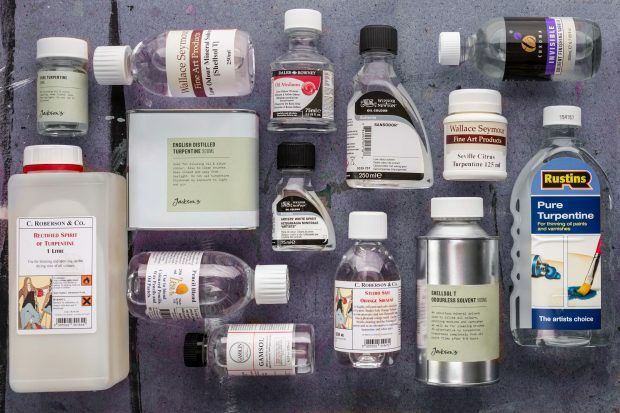 Use Artist’s White Spirit – it is free from residual sulfur, and won’t contribute to any deterioration in your work over time. What Is Low Odour Solvent? Low Odour solvent (a.k.a. Odourless Mineral Spirits) white spirit that has been refined further to remove toxic aromatic compounds. You should use low odour solvent over regular white spirit if you regularly come into close contact with your solvent. 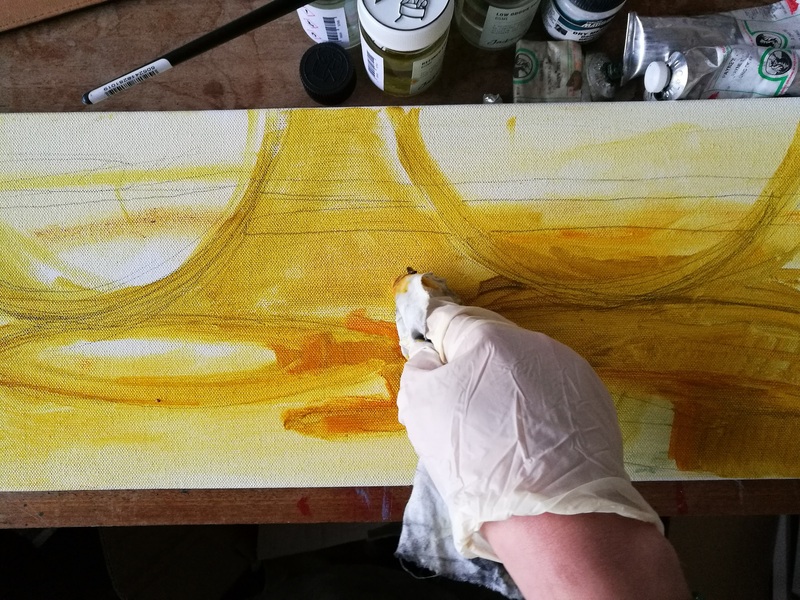 While Artist’s White Spirit can be used to clean oil painting brushes, we would advise using low odour White Spirits such as Gamsol, Low Odour Solvent, Shellsol T and Sansodor in painting mediums. Petroleum distillates will not dissolve natural resins such as dammar, copal or mastic, but it will dissolve alkyd resins. Therefore use low odour solvent to thin Oil, Alkyd paints and alkyd mediums, but not varnishes or any mediums (such as glaze mediums) that contain natural resins. 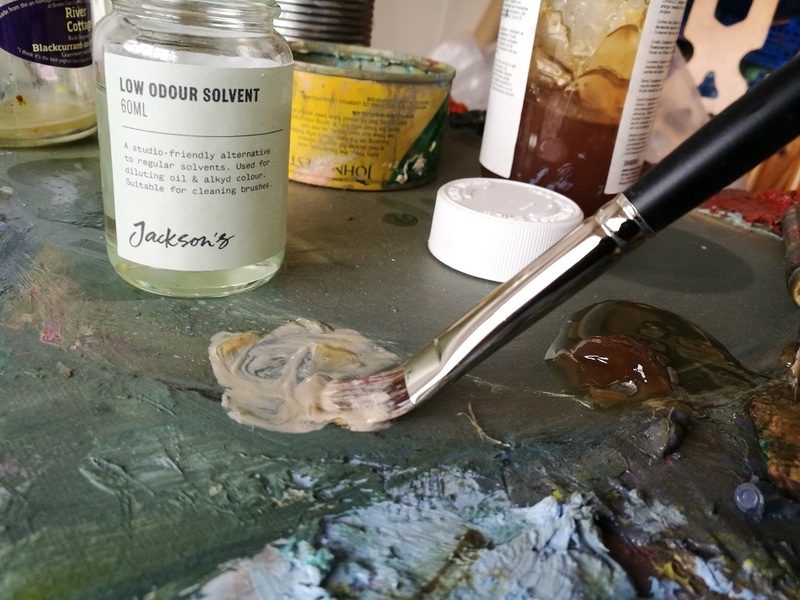 If you’ve browsed the solvents on Jacksonsart.com and want to know what MSA Solvent is for… Golden MSA Solvent is a specialist White Spirit formulated to thin Golden’s MSA Varnish; I’ve not tried it to thin oil paint but if you have we’d love to hear how it performed. Gamsol has so little odour for a white spirit. It’s definitely worth the extra investment if you are sensitive to fumes. And it will thin Alkyd better than turpentine and turpentine alternatives. You might hear turpentine being called Spirit of Turpentine or Oil of Turpentine, but it’s all the same stuff. It is slightly more viscous than white spirit. Good quality turpentine will smell of the pine trees used to make it. To make turpentine, turpentiners remove the bark of the tree which causes it to secrete oleoresin on to the surface of its wound. The raw oleoresin is then purified using a distillation process, carried out in a copper still. Turpentine is flammable and emits vapours that can irritate the skin and eyes and damage the lungs. Don’t use Household turps for art – it is likely to leave a gum residue that may prevent your painting from fully drying or cause yellowing to occur over time. Use Triple Distilled Artist’s Turpentine instead. It has far fewer impurities and as a result will perform better, dry faster and will not yellow. The highest quality turpentine (e.g. Rectified Spirit of Turpentine) is made solely from the resin of Pine trees which gives it a clean, pleasant scent. Conversely, the forest waste used to make lower quality turpentine gives it a bad smell! 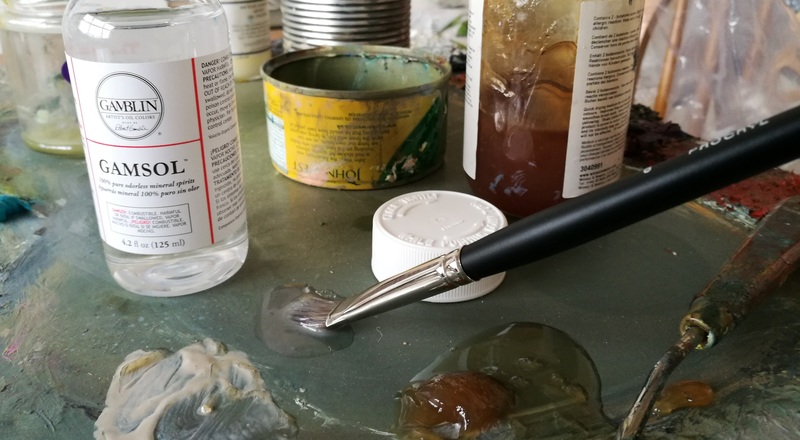 Although it is possible to purify low grade turpentine enough to make it suitable for oil painting, it will always have a less than pleasant smell. Larch Venice Turpentine is a professional grade painting medium which is not suited to thinning paints and cleaning brushes. Collected from the heart of the larch tree, it is a highly viscous balsam. It is free from abietic acid crystals which can cause discolouration. Larch Venice Turpentine will not cause yellowing and dries with an enamel-like gloss. It is slow drying, thixotropic, and is a wonderful ingredient for glaze mediums and varnishes. Place Larch Venice Turpentine in a Bain Marie or dilute it with high quality distilled turpentine to make it more fluid. There are now a number of Citrus-scented turpentines available. These include Zest-It, Seville Citrus Turpentine and Studio Safe Orange Solvent. Citrus turpentines are non flammable and non aromatic. They are more closer to turpentine than Petroleum Distillate as they will dilute natural resins such as Copal, Mastic and Dammar. They will not leave any residue and are a great solvent to use both in cleaning up and thinning oil paints and mediums. Do not use Household Turpentine in your art studio as it is likely to leave a residue in painting mediums and cause yellowing over time. Triple Distilled turpentine will dry more quickly, evenly, and will not leave a residue. 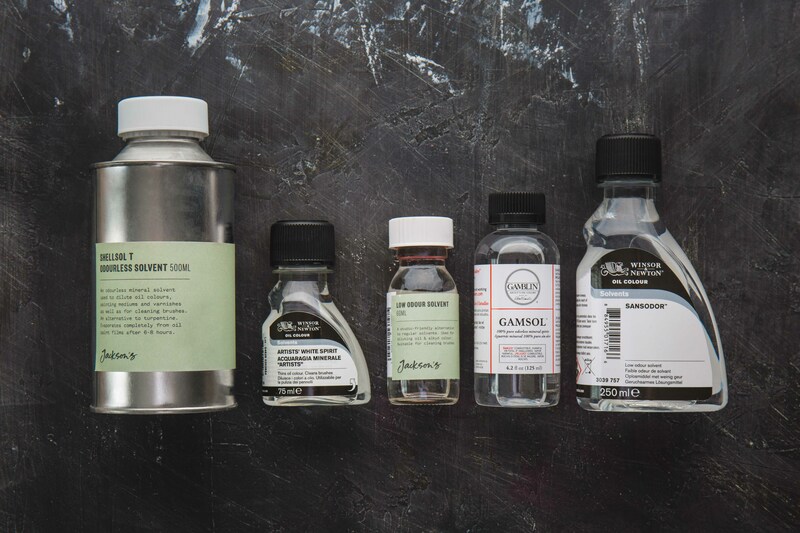 Pure Turpentine is usually only singularly distilled and so is best left for cleaning brushes and palettes only. Citrus based Solvents such as Zest-It, Studio Safe Orange Solvent and Citrus Turpentine are non flammable and non aromatic. As a result they emit hardly any heady fumes and tend to be kinder to skin too. They are also suitable for use in painting mediums. brushes; can they be mixed? I’m not sure what would happen if the turpentine and Zest It are physically mixed together, although I can’t imagine anything too untoward would happen – worth a try with small quantities of both in a little jar just to see if any clouding occurs. But if you wish to use turps for painting and Zest It for the clean up operation that would be fine. Next time I’m in my studio I’ll try mixing turps and Zest It – if you get to give it a go before me let me know if you notice anything! my area, and I’m not even sure it’s available in Canada. that will add that oily suppleness back into the paint. REPLENISHING TO GET THE ORIGIBAL SUPPLENESS. Sansodor is a Winsor & Newton product. Most low-odour solvents are a type of white spirit (mineral spirits). 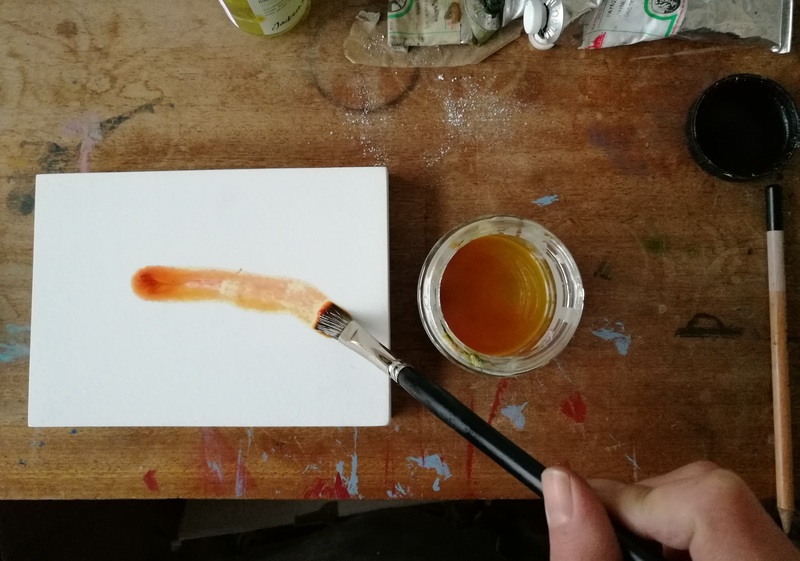 I have done tests with different solvents to dilute a varnish that comes concentrated and must be diluted – and I got some very different results. The turpentine and white spirit worked as needed leaving a usable thin fluid varnish. The low-odour solvents including the citrus solvents made the varnish cloudy and instantly thickened, sometimes to a near solid. So you might need to do some tests if you can’t find the solvent recommended by Pebeo. All the low-odour solvents worked the same for my test, so they are similar enough that you might be able to use another brand. I use Gamsol to dilute my alkyd oil mediums as they start to lose their suppleness. Unfortunately we cannot ship solvents by air so are unable to send to Canada. But you should be able to find the same ones in your country. 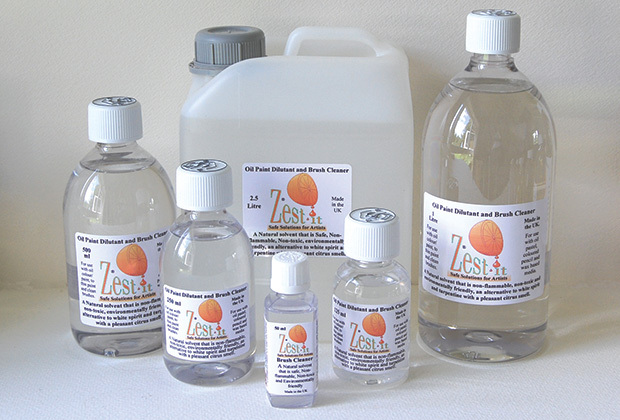 whether Zest-it can be used with alkyd mediums? Hi, thanks for the very informative article. alkyd mediums such as Galkyd or Liquin? Thanks. Thanks for reading and your comment. I have used Zest It with Liquin and oil paint and not found any issues, works OK for me.